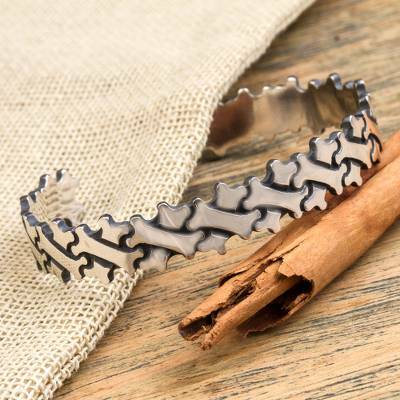 Hand Made Sterling Silver Cuff Bracelet Bone Motif Mexico, "Little Bones"
Angel Ortiz recreates images from the Aztec tzompantli to create this mystical cuff bracelet. The tzompantli was a rack or altar where skulls of sacrificial victims were displayed. Working in precious sterling silver mined in Taxco, the artisan explores the symbols of Mexico's pre-Hispanic cultures. "I wear this all the time."